Blueberries should not be washed until ready to eat as berries will mold when moist. Berries can sit at room temperature for two days, can be refrigerated for one week, and frozen for one year. Berries should not be washed before freezing, but wash when thawed. Blueberries are ranked as the #1 fruit for antioxident benefits. Blueberries are an excellent source of Vitamin C; a good source of dietary fiber; and an excellent source of manganese, as well as iron and minerals. Fat free, one cup contains only 86 calories. A single bush can produce 6,000 berries per year. There are only 3 fruits native to North America- blueberries, cranberries, and Concord grapes. Botanists say that blueberries have been around for 13,000 years. 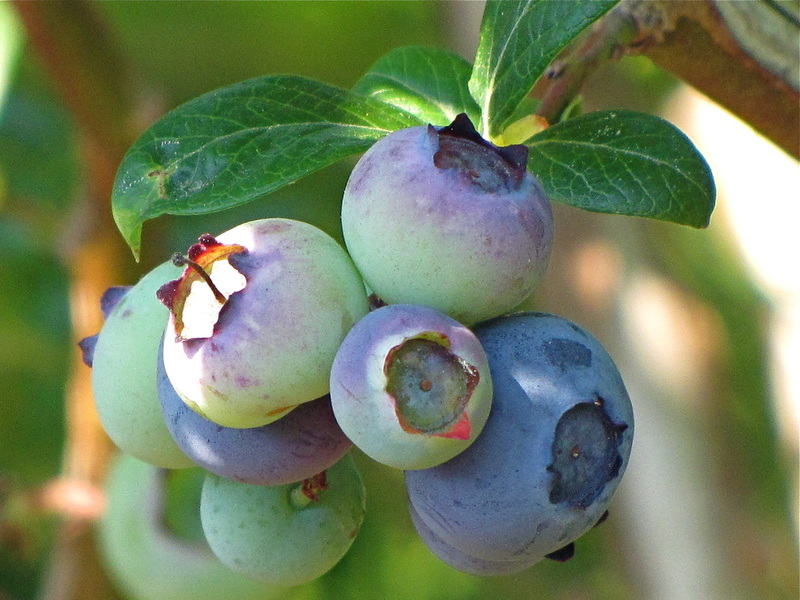 Native Americans gave blueberries to the early colonists in New England to see them through their first winter. Blueberries are an important source of nutrition and hydration not only for humans, but for birds, insects, various mammals, including deer, foxes, coyotes, and squirrels, and our favorite- turtles; all of which we have seen at the farm. In 1999, the U.S.D.A. declared July to be National Blueberry Month. We have 1,500 blueberry bushes at our farm. We grow the following varieties: Duke, Spartan, Coville, Blue Crop, Blue Gold, and Late Blues. We also recommend Nelsons. 1.) We fertilize the plants five weeks a year in early spring (through the drip irrigation system) with a synthetic fertilizer similar to Miracle Grow. We also use organic fertilizer, leaf mulch. 2.) At times we have found it necessary to treat the field for insects, like Winter Moth, and for various fruit diseases. We monitor the plants ourselves and with the assistance of the Cooperative Extension Service. We only treat the bushes when absolutely necessary. This is called Integrated Pest Management (IPM). The pesticides we choose are ones that are effective and also have the least impact on the environment. We will provide specific information as it arises about our pest control procedures. The required pre-harvest interval is always observed between treatment and consumption. However, concerned parties can bring a water bottle to the field if they wish to wash berries before they pop them into their mouths. We always have water available at the farm stand. The quality of our crop, the safety and satisfaction of our patrons, and the responsible stewardship of the local environment and its wildlife are all of paramount importance to us. This is the way we want our farm to be for ourselves as well as for you. For information on netting your own blueberry plants see our Links section.